"The LORD saw how great man's wickedness on the earth had become, and that every inclination of the thoughts of his heart was only evil all the time. The LORD was grieved that he had made man on the earth, and his heart was filled with pain. So the LORD said, "I will wipe mankind, whom I have created, from the face of the earth--men and animals, and creatures that move along the ground, and birds of the air, for I am grieved that I have made them." Gurkha, flying a swift and powerful vimana hurled a single projectile charged with all the power of the Universe. An incandescent column of smoke and flame as bright as the thousand suns rose in all its splendor... a perpendicular explosion with its billowing smoke clouds...the cloud of smoke rising after its first explosion formed into expanding round circles like the opening of giant parasols... it was an unknown weapon, an iron thunderbolt, a gigantic messenger of death, which reduced to ashes the entire race of the Vrishnis and the Andhakas. ...The corpses were so burned as to be unrecognizable. The hair and nails fell out; pottery broke without apparent cause, and the birds turned white. After a few hours all foodstuffs were infected... to escape from this fire. The soldiers threw themselves in streams to wash themselves and their equipment. A Nuclear Catastrophe in Paleoindian Times? Desert Glass Scarab. What produced the intense heat in the desert? As we look at a bit of what is being called evidence of ancient atomic warfare (or simply atomic explosions), it is important to make a distinction. It is important that we can establish through available evidence some seen on other pages here-- that: the Bible does in fact mention dinosaurs, that man and dinosaurs co-existed as the Bible would indicate; that DNA is proof of a creator, that the worldwide flood of Noah did happen, and that the world was created in one week as the Word says. We have pondered the question of the technological sophistication of pre-flood civilizations. Atomic warfare or atomic capability would be another indication of this sophistication and little else. It may be that if it existed it was part of the wickedness that God saw, as referenced by the quote from Genesis 6 at the top of this page. The most interesting story on these pages is the absolutely true story of the Oklo mines. On the other hand, there will be consternation that would result among materialists/evolutionists, if it could be proven that this technology did in fact previously exist. It would be very difficult to fit that knowledge into the current paradigm, wouldn't it? As for believer's such a confirmation could only bolster our confidence that when we say to materialists that "there are things in Heaven and earth that are not dreamed of in your philosophy", that that is proving truer every day. There are some interesting things to consider, and we should just take a look at it and form a conclusion. It may well be that we will reject all of the "evidence" or merely some of it. It's certainly worth a couple of minutes of our no doubt valuable time to give a look. The "evidence" will largely fit in four categories. 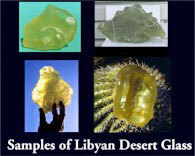 When the first atomic bomb exploded in New Mexico, the desert sand turned to fused green glass. This fact, according to the magazine Free World, has given certain archaeologists a turn. They have been digging in the ancient Euphrates Valley and have uncovered a layer of agrarian culture 8,000 years old, and a layer of herdsman culture much older, and a still older caveman culture. Recently, they reached another layer of fused green glass. It is well known that atomic detonations on or above a sandy desert will melt the silicon in the sand and turn the surface of the Earth into a sheet of glass. But if sheets of ancient desert glass can be found in various parts of the world, does it mean that atomic wars were fought in the ancient past or, at the very least, that atomic testing occurred in the dim ages of history? This is a startling theory, but one that is not lacking in evidence, as such ancient sheets of desert glass are a geological fact. Lightning strikes can sometimes fuse sand, meteorologists contend, but this is always in a distinctive root-like pattern. These strange geological oddities are called fulgurites and manifest as branched tubular forms rather than as flat sheets of fused sand. Therefore, lightning is largely ruled out as the cause of such finds by geologists, who prefer to hold onto the theory of a meteor or comet strike as the cause. The problem with this theory is that there is usually no crater associated with these anomalous sheets of glass. Brad Steiger and Ron Calais report in their book, Mysteries of Time and Space, that Albion W. Hart, one of the first engineers to graduate from Massachusetts Institute of Technology, was assigned an engineering project in the interior of Africa. While he and his men were traveling to an almost inaccessible region, they first had to cross a great expanse of desert. "At the time he was puzzled and quite unable to explain a large expanse of greenish glass which covered the sands as far as he could see," writes Margarethe Casson in an article on Hart's life in the magazine Rocks and Minerals (no. 396, 1972). She then goes on to mention: "Later on, during his life he passed by the White Sands area after the first atomic explosion there, and he recognized the same type of silica fusion which he had seen fifty years earlier in the African desert." "Well, yes, in modern history." Other unique attributes: Color, Bubble types: 100% of included bubbles are lenticular or irregular. If you could go back and read the news and scientific articles at the time, you could contrast the shock, dismay and confusion caused by the initial announcement that nuclear material had been mined in the past and that the byproduct plutonium had been created at Oklo. In 1972, a French analyst named Bougzigues working at the Pierrelatte nuclear fuel processing plant detected a small but significant change in an important ratio between Uranium 235 and Uranium 238. The proper ratio is well known and well established in that field so that the change indicated that something way out of the ordinary was going on. The initial suspicion was that someone had included spent fuel in with the recently mined ore. This was quickly ruled out because there was no radiation signature associated with the mystery uranium. 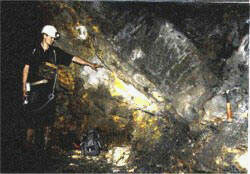 The mystery uranium was eventually traced back to the Gabon mine at Oklo. You need to understand that what was so incredible was that a nuclear reaction had occurred such that plutonium was created and that the nuclear reaction itself had been “moderated”! This means that once a reaction is initiated, if you want to harness the power output in a controlled manner, you had better be able to keep it from exploding and releasing all the energy at once. This particular group of reactors was, incredibly moderated using..., water. The first modern nuclear reactors used graphite and cadmium rods to moderate their reactions. At that time, people were speculating about aliens and advanced ancient civilizations. Some months after the discovery rocked the scientific world, someone came up with a somewhat dubious explanation which over time has taken on the patina of absolute certainty. It was a natural reactor which occurred billions of years ago. 4) Nature designed the reactor such that its spent fuel and dangerous byproducts were "contained"
Scientists use the principle of uniformism to draw conclusions about the future and the past. If they cannot use this "principle", then they can not draw any conclusions because they could not state that the conditions in the universe that exist now, always existed. Here though as often happens, they have to assume that the past was vastly different as it related to the possibility of naturally occurring breeder reactions. Again, scientists from other countries were skeptical when first hearing of these "natural nuclear reactors". Some argued that the missing amounts of U-235 had been displaced over time, not split in nuclear fission reactions. "How," they asked, "could fission reactions happen in nature, when such a high degree of engineering, physics, and acute, detailed attention went into building a nuclear reactor?" Surprisingly, this uranium mine's nuclear reactor was well designed. Studies indicate that this reactor was several miles in length. However, for such a huge nuclear reactor, the thermal impact to its environment was limited to 40 meters on all sides. 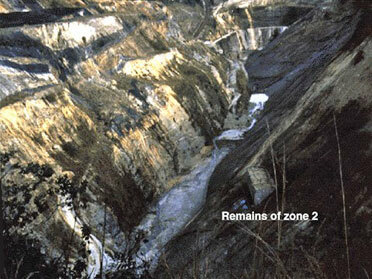 Even more astonishing is the fact that the radioactive wastes have still not migrated outside the mine site. They are held in place by the surrounding geology. Faced with these findings, scientists consider the mine to be a "naturally occurring" nuclear reactor. The Oklo reactor has been documented for its importance as an analogue (a structural derivative of a parent compound) in the disposal of nuclear fuel wastes. But few people are bold enough to go one step further. As a matter of fact, many people today know that the reactor is a relic from a prehistoric civilization. It's probable that two billion years ago there was a fairly advanced civilization living at a place now called Oklo. "The natural uranium in the Oklo mine in Gabon, West Africa, contains an abnormal amount of U235. It is as low as 0.29%, rather than the normal 0.72%. This means that many self-sustained nuclear fission chain reactions took place at this mine about two billion years ago. Thirteen nuclear reactors existed in prehistoric periods along the 200-metre mine bed, and they were comparable to the modern nuclear reactor in power and heat combustion. This mine had the capability of enabling self-sustained nuclear chain reactions...."
This discovery, that shocked the entire scientific community in 1972, has already been forgotten by people today. 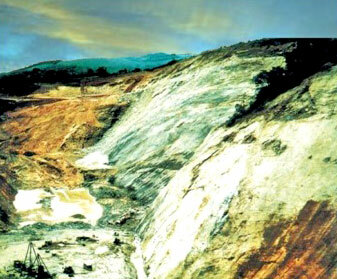 In 1972, French scientists discovered that several natural concentrations of uranium ore had become critical and flared up some "2 billion" years ago at Oklo, Gabon. In the deep earth, where pressures and densities are high, natural nuclear reactors may generate intermittent bursts of heat -- just as they did at Oklo -- and thereby cause the earth's dynamo to falter and reverse. Jupiter, Saturn, and Neptune emit much more energy than they receive from the sun. Natural nuclear reactors could be the reason. Astronomers assume that the high temperatures required to ignite the thermonuclear reactions powering stars come from gravitational collapse, but this source does not seem adequate to some scientists. Nuclear fission reactors could ignite stars just as they do H-bombs. When excavations of Harappa and Mohenjo-Daro reached the street level, they discovered skeletons scattered about the cities, many holding hands and sprawling in the streets as if some instant, horrible doom had taken place. People were just lying, unburied, in the streets of the city. And these skeletons are thousands of years old, even by traditional archaeological standards. What could cause such a thing? Why did the bodies not decay or get eaten by wild animals? Furthermore, there is no apparent cause of a physically violent death. 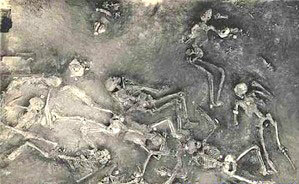 These skeletons are among the most radioactive ever found, on par with those at Hiroshima and Nagasaki. At one site, Soviet scholars found a skeleton which had a radioactive level 50 times greater than normal. Other cities have been found in northern India that show indications of explosions of great magnitude. One such city, found between the Ganges and the mountains of Rajmahal, seems to have been subjected to intense heat. Huge masses of walls and foundations of the ancient city are fused together, literally vitrified! And since there is no indication of a volcanic eruption at Mohenjo-Daro or at the other cities, the intense heat to melt clay vessels can only be explained by an atomic blast or some other unknown weapon. The cities were wiped out entirely. Another curious sign of an ancient nuclear war in India is a giant crater near Bombay. 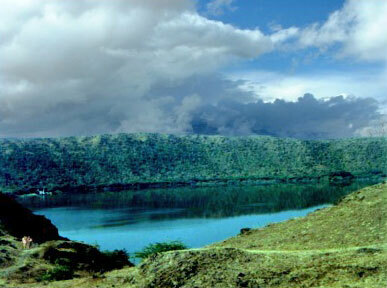 The nearly circular 2,154-metre-diameter Lonar crater, located 400 kilometers northeast of Bombay and aged at less than 50,000 years old, could be related to nuclear warfare of antiquity. 1. The lake has two distinct regions that never mix - an outer neutral (pH7) and an inner alkaline (pH11) each with its own flora and fauna. You can actually do a litmus paper test here and check this for yourself. 2. There is a perennial stream feeding the lake with water but there seems to be no apparent outlet for the lake�s water. And it is also a big unsolved mystery where the water for the perennial stream comes from, in a relatively dry region like Buldhana. Even in the driest months of May and June, the stream is perpetually flowing. Lonar generates questions and more questions�. We introduce here a remarkable theory of terrestrial catastrophism that seems to be supported by evidence that is equally remarkable. One of the authors of this theory (RBF) is identified as a nuclear scientist at the Lawrence Berkeley Nuclear Laboratory. The second author (WT) is a consultant. The authors' credentials seem so good that we must take a close look at their extraordinary claims concerning a natural phenomenon that they believe reset radiocarbon clocks in north-central North America and---potentially---elsewhere on the planet. We will be most interested in the reception accorded these claims by the scientific community. Our research indicates that the entire Great Lakes region (and beyond) was subjected to particle bombardment and a catastrophic nuclear irradiation that produced secondary thermal neutrons from cosmic ray interactions. The neutrons produced unusually large quantities of ^239 Pu and substantially altered the natural uranium abundances (^235 U/^238 U) in artifacts and in other exposed materials including cherts, sediments, and the entire landscape. These neutrons necessarily transmuted residual nitrogen (^ N) in the dated charcoals to radiocarbon, thus explaining anomalous dates. Some North American dates may in consequence be as much as 10,000 years too young. So, we are not dealing with a trivial phenomenon! Four main categories of supporting evidence are claimed and presented in varying degrees of detail. Physical evidence of particle bombardment. Example: chert artifacts with high densities of particle-entrance wounds. Anomalous uranium and plutonium abundance ratios in the affected area. Tree-ring and marine sediment data. The authors claim that the burst of radiation from a nearby supernova, circa 12,500 years ago, not only reset radiocarbon clocks but also heated the planet's atmosphere, melted ice sheets, and led to biological extinctions. If verified, the claimed phenomenon would also "reset" archeological models of the settlement of North and South America. To illustrate, we may have to add as many as 10,000 years to site dates in much of North America! Thus we add another potential cause of an often-hypothesized 12,500-BP catastrophe that is said to have changed the world's history. Competing theories involve asteroid impact, volcanism, a Venusian side-swipe, etc. 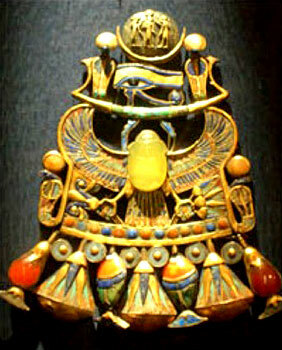 The jewel was tested and found to be glass, but intriguingly it is older than the earliest Egyptian civilization. Working with Egyptian geologist Aly Barakat, they traced its origins to unexplained chunks of glass found scattered in the sand in a remote region of the Sahara Desert. But the glass is itself a scientific enigma. How did it get to be there and who or what made it? The BBC Horizon programme has reported an extraordinary new theory linking Tutankhamun's gem with a meteor. American geophysicist John Wasson is another scientist interested in the origins of the glass. He suggested a solution that came directly from the forests of Siberia. "When the thought came to me that it required a hot sky, I thought immediately of the Tunguska event," he told Horizon. In 1908, a massive explosion flattened 80 million trees in Tunguska, Siberia. Although there was no sign of a meteorite impact, scientists now think an extraterrestrial object of some kind must have exploded above Tunguska. Wasson wondered if a similar aerial burst could have produced enough heat to turn the ground to glass in the Egyptian desert. The first atomic bomb detonation, at the Trinity site in New Mexico in 1945, created a thin layer of glass on the sand. 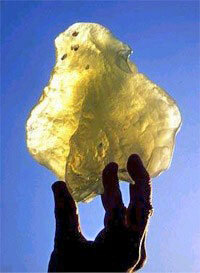 But the area of glass in the Egyptian desert is vastly bigger. Whatever happened in Egypt must have been much more powerful than an atomic bomb. 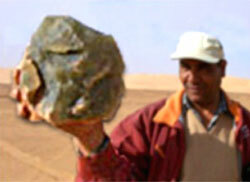 image right - Barakat holds up one of the many, huge chunks of glass in the desert. A natural airburst of that magnitude was unheard of until, in 1994, scientists watched as comet Shoemaker-Levy collided with Jupiter. It exploded in the Jovian atmosphere, and the Hubble telescope recorded the largest incandescent fireball ever witnessed rising over Jupiter's horizon. Mark Boslough, who specializes in modeling large impacts on supercomputers, created a simulation of a similar impact on Earth. The simulation revealed that an impactor could indeed generate a blistering atmospheric fireball, creating surface temperatures of 1,800C, and leaving behind a field of glass. "What I want to emphasize is that it is hugely bigger in energy than the atomic tests," said Boslough. "Ten thousand times more powerful." The more fragile the incoming object, the more likely these airborne explosions are to happen. In Southeast Asia, John Wasson has unearthed the remains of an event 800,000 years ago that was even more powerful and damaging than the one in the Egyptian desert; one which produced multiple fireballs and left glass over three hundred thousand square miles, with no sign of a crater. "Within this region, certainly all of the humans would have been killed. There would be no hope for anything to survive," he said. According to Boslough and Wasson, events similar to Tunguska could happen as frequently as every 100 years, and the effect of even a small airburst would be comparable to many Hiroshima bombs. Attempting to blow up an incoming asteroid, Hollywood style, could well make things worse by increasing the number of devastating airbursts. "There are hundreds of times more of these smaller asteroids than there are the big ones the astronomers track," said Mark Boslough. "There will be another impact on the earth. It's just a matter of when." William: �Ahhh. Look at what the wind blew in. How ya doin�? Robert: �Must have been an ill wind, huh�? William: �Nah, not at all. Good to see you! Pull up a chair. Everyone else has deserted me out here. How�s the wife and kids�? Robert: �She�s fine. She still doesn�t know it�s me that�s been spying on her and following her around. Someday I�m going to marry that girl and -I�ve got my eye on a coupla kids I think she�s really going to like, as well! Hey! What�re we having? Smoked turkey? I guess, you being a Christian and all will have to pass on it? I mean cannibalism is a sin, right�? William: �That�s very droll, Rob. I suppose you�ll be very happy to hear for the exact same reasons that there will be two turkeys and no ham?, You know that when it gets hot out people around you always think they smell bacon�. William: �Not that I�m keeping track, but that�s actually �three che�. Robert: �Yeah, he�s already here. That�s one of the reasons I�m out here in the cold with you. I wasn�t gearing up to have to see him until over at the house tomorrow�. William: �You still haven�t forgiven him for turning his back on your religion, huh�? Robert: �Atheism isn�t a religion and it�s not even about that�. William: �You know he�s coming to church with me these days�? William: I don�t believe Uncle Mike is dead. As a matter of fact, he was upstairs stuffing his face when I came out here�. Besides, do Atheists believe in consciousness after death? William: �I think he drinks because he needs to in order to continue to be an �intellectually fulfilled Atheist�. You do remember that time as kids when we saw him praying over Mom when she was sick in the hospital�? Robert: �That was no hospital, that was Kaiser. And he swears that he was- throwing up a rum and diet coke. If he knew you were still doubting his story he�d be turning over in his grave right now. Plus, if he was praying, it didn't do much good, did it"? Robert: After a few minutes of companionable silence: �So, did you get my e-mail? The one about Oklo�? William: �Oh, man! I should have known why you made a beeline out here! I thought maybe you were out here just to hang out. Please tell me that you don�t want to get involved in yet another evolution/creation debate�? Robert: �No, not so much a debate. A discussion�. William: �Let�s save some time, why don�t you just stalk off�? Robert: "I've got the goods, this time! Well, I always had the goods but this information I think you�ll find is very compelling evidence for an �old universe� and an �old earth��. He pulled some folded pages from his back pocket. William: �For crying out loud! You brought the e-mail with you to a family celebration just so we could argue about it? Look I�m not sure that this is a good time for this, I�m frying a turkey, here�. 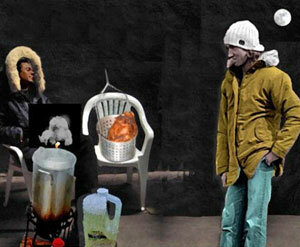 Robert: �Yeah well I�m trying to fry a turkey, too, bro. Would you be so kind as to pass me the peanut oil and close your eyes�? �In the early 1970s, French scientists noticed something odd about samples of uranium recovered from the Oklo mine in Gabon, West Africa. All atoms of a specific chemical element have the same chemical properties, but may differ in weight; these different weights of an element are known as isotopes. Some uranium samples from Gabon had an abnormally low amount of the isotope U-235, which can sustain a chain reaction. This isotope is rare in nature, but in some places, the uranium found at Oklo contained only half the amount of the isotope that should have been there. �. The uranium in the Earth contains dominantly two uranium isotopes, U-238 and U-235, but also a very small percentage of U-234, and perhaps small, undetectable amounts of others. All of these isotopes undergo radioactive decay, but they do so at different rates. In particular, U-235 decays about six-and-a-third times faster than U-238. Thus, over time the proportion of U-235 to U-238 decreases. But this change is slow because of the small rates of decay. Generally, uranium isotope ratios are the same in all uranium ores contained in nature, whether found in meteorites or in moon rocks. Therefore, scientists believe that the original proportions of these isotopes were the same throughout the solar system. At present, U-238 comprises about 99.3 percent of the total, and U-235 comprises about 0.7 percent.5 5 Any change in this ratio indicates some process other than simple radioactive decay. William tried to speak. Robert held up his hand. �Ultimately, the mystery was unraveled, when it was discovered that in the pockets of depleted uranium ore a characteristic spectrum of byproducts of nuclear fission were also present and in the distinctive ratio that might be anticipated if a natural fission reactor had produced them. The U-235 from Oklo had been depleted partly because it had become the fuel of the reactor. It had also dwindled through time, simply by its own radioactive decay. By calculating how long ago the U-235 had been sufficiently concentrated to fuel a chain reaction, the scientists were able to date the time it was operating to 2 billion years ago, about the age of rocks in which the uranium ore was found�. �Next�, he said is this quote from Don Lindsay: �Another evidence is the natural nuclear reactor at Oklo, in Gabon. This reactor was actually just an unusually rich body of radioactive ore. So rich, in fact, that when it was formed, it approached critical mass. 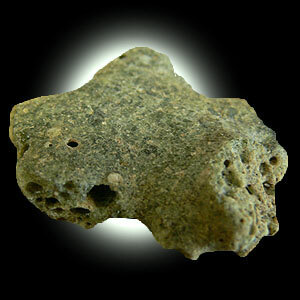 Studies of the unusual elements found there indicate that reactors acted the same two billion years ago as they do now. If the fine structure constant had been different by as little as one part in a million, the Oklo measurements should have detected that�. �Finally�, he concluded, �the mutagenic radiation from such natural reactors some 2 billion years ago could have been a major driving force in evolution! Robert waited a moment but William hadn�t made a response. �Go on�, he said. William: �Oh, I can speak now? Thanks, but I�m not even sure where to start�. William: �Yeah, no. I�d heard about Oklo years ago. Plus I did read all the stuff in your e-mail. It�s just that this will be our 1,000th discussion on these sort of topics and history tells me that even after hours of discussion, neither one of us is going to change his beliefs one bit. I don�t feel like I�ve got that kind of time, plus it�s cold, plus I�ve got to focus on frying this turkey and plus that other bird is going to freeze if I don�t get it in the house�. Robert: "Okay, we�ll save the full discussion for e-mail. Just give me some of your initial thoughts because frankly, I don�t think there is an adequate young earth response to the Oklo phenomenon.. Wait one minute, and I�ll run your turkey inside. Get your thoughts together in the meantime�. Robert: �Like its 1999. Get your little fundamentalist thoughts together, and I�ll be right back�! When Robert came back he handed a tumbler to William. Robert: �Some hot chocolate. You�re welcome�. William: Thanks! Umm. Do Atheists wash their hands? Cuz, you know, though its not in the Bible, they say; cleanliness is next to ...Godliness. Oh, and tell me this? I've always wondered; what do I say if you sneeze?! Robert: "You simply apologize for forgetting about my allergy to cheap cologne." Robert: �Gratuitous insult.� You�re simply saying that you don�t need evidence. William: "We do need evidence, I�m just not limited to what you call evidence. Imagine if someone says that they could only understand love if they can put it into some kind of scientific formula, or measure it out to prove it experimentally? �Science �can tell us little about the appreciation of a sunset, about the soul of man or so many other things. For that matter, science can tell us very little about the mind itself. Robert: "You are going to talk about Oklo, right? William: �Special Creation� however, is something that happens �pre-science�. The fact of the matter is, if you were inclined to stick exclusively to science, the 1st law would turn you away-it tells you not to look here in science because all we can tell you is that all this matter you see..? It can�t be created! If you want to know about creation, you have to look outside of science�. William: "Okay. For all the years we�ve been talking about this, I�ve been consistent about what I believe, Seven actual days, special creation, i.e. God did it, He is the creator, a global worldwide flood , a young earth. Right.� Now, consistent with that, the laws of the universe are now set. But consistent with my beliefs, when Adam and Eve were created there was no death. By the way, I've been consistent but whether you realize it or not, you've been nothing but. Whatever you assert confidently about evolution, or the universe or the "big bang" is likely to be changed the next time. I saw an article yesterday that I didn't read that says the big bang needs to be moved back 2 billion more years. Me, I'm sticking with created in seven days. You know what Rob, I'll tell you the same tomorrow. To be more specific about the 1st and 2nd laws of physics, my assumption is that in the beginning, the 1st law was set, but not the second, which is entropy�systems over time will lose energy and become less organized. I believe entropy came into existence after the fall. That is, death was introduced into this world; the spiritual death of man, the physical death of man and animal, and the beginnings of the physical death of the universe. At the beginning death was not part of the plan, nor was the winding down of the creation. I�ll come back to this point. Now, Oklo, okay? Materialists have available to them only one solution for the Oklo phenomenon; a naturalistic one. Nothing else fits uniformism and gradualism. On the other hand, Christians certainly can�t accept a natural explanation, particularly if it is one that takes 1.8 billion years to occur. Neither Christians nor evolutionists apparently considered the idea of sophisticated civilizations prior to the flood of Noah. Well, evolutionists wouldn't but even Christians who believe in the flood tend to think of the pre-flooders as nomadic herdsmen with no technology. For that reason, the very first thing that should have occurred to both groups about Oklo did not. Occam�s Razor (when there are multiple explanations- choose the simplest one) should have led to the conclusion-or at least the consideration that this was a �designed system� and not a natural one! Even though materialists were �freaked out� by the discovery and even though as you read the scientific world initially resisted the idea of a natural reactor they never for a minute considered the idea that �cave men� (because of their view of earlier man) could have built a breeder reactor! But consider; this reactor produced energy comparable to a modern nuclear reactor, was moderated by water so that the reaction could be controlled, and to this day still contains the waste products from the reactor. In short, this system was �well designed�, whether by nature or by man!. I submit to you that to believe it was built by aliens makes more sense to me than the idea that somehow nature built it (I don�t believe aliens exist). To say that you accept the idea that it was a natural phenomenon rather than a designed reactor proves that you probably don�t know how much technology went into building a working breeder reactor. As for Dembski�s design filter; Dembski himself probably never considered that the reason his filter might �select� the Oklo reactor as a product of design is that it is in fact a product of design! Robert: "You can�t be serious�!? William: "Look! I�m not saying that the reactors were designed and built by man as a certainty. Whether or not it was or wasn�t does not impact me as a Christian. I�m saying that this should have been the very first thing considered or that it should have at the very least been on the list. I can send you a link later on of some creation scientists who accept the idea that it is natural reactor but who show that it could still have happened in the context of a young earth, but A mistake being made here is the idea that technology will always look the same�that advanced technology had to take the form that it did in this present age. Let me ask you this; if you had to direct a team and the resources to build the great pyramid with the technological level and tools we say were available to the supposed builders thereof, the Egyptians (and whatever you may think, there is no firm evidence in any way that connects the pyramids of the Giza plateau to the dynastic Egyptians) �or you had to direct the team and resources to place a man on the moon with the technology we had in the sixties , which challenge would be more difficult? Do not be so quick to choose landing a man on the moon with the technology available at that time. In order to build the pyramid, you would have had quarry and then move 2.3 million granite or limestone blocks weighing between 2.5 and 50 tons, 600 miles to the site of the pyramid. Keep in mind that the copper and bronze tools experts say the Egyptians used to precisely cut the stone blocks are softer than the limestone and granite blocks. Keep in mind that you will need to lift and precisely place granite blocks, some again weighing nearly 50 tons, to a height of nearly 500 feet. That's 50 stories. These stones will need to be placed with such tolerances that a razor blade will not fit between them Your pyramid will when finished line up with the four points of the compass with an accuracy of .06 degrees, without a compass. Your team will need to level the 13-acre limestone bedrock base to a degree of accuracy only recently achieved with laser technology using only the known technology of the Dynastic Egyptians. Among technological attributes too numerous to mention, your team will have to excavate what�s known as the �Descending Passage� some 350 feet into solid bedrock using copper and bronze tools, at a 26-degree angle all the while keeping the tunnel arrow-straight for its entire length�! Robert: (Feigning a yawn?) �Thanks! That�s fascinating! Not! Look, can you please tell me how you moved from the Oklo natural reactor to a man made triangle? I really want you to focus Billy if you can. How do you react to the information I provided about Oklo? William: �My point is, there is evidence of ancient high technology other than the ancient nuclear facility at Oklo�. Robert: "Look, I�ll bite. The technology that built the great pyramid is in no way comparable to the technology or effort it took to put a man on the moon. I guess that means that I would take the pyramid. Give me enough slave labor and I�ll bring it in on time and under budget! The moon landing on the other hand required computers-much higher technology�! William: "I don't think millions of unskilled slave laborers are going to help you build one of the seven wonders of the ancient world. How could you do it when experts are still arguing about how it was done in the first place? The point is, the choice is not a foregone conclusion. If you accept the dating of the current experts on the great pyramid, then for more than 5,000 years this precisely built yet huge structure was the tallest structure built by man. It�s been less than two hundred years since its height was surpassed. It�s almost 50 stories high and is built to a much higher precision that any modern high-rise!�! Robert: �Moving on to Oklo:�? William: �What makes me laugh is the example we "creationists" use re: the tornado in the junkyard. The idea that the odds of evolution working to produce the diversity of life on earth would be like a tornado coming through a junkyard and completely assembling a 727. The problem is, we underestimate the gullibility of materialists! I mean, you�ll take those odds every time if it means that you don�t have to get down on your knees to worship God! William: :�Best two billion out of three�!? William: �Your faith is almost inspirational. Okay. How did they conclude that the �natural reactor� was active nearly 2 billion years ago? I�ll tell you how. By making the assumption that the nuclear decay rate or half-life of U235 has always remained constant. In other words, if the present laws and constants of nature had extended throughout the past, the Oklo uranium deposit could have become critical close to 2 billion years ago. Additionally, the conditions for a moderated reaction do not exist today and must be assumed to have existed in the past. So, this is what happened re: Oklo. 1) Freak out. 2)Sweat. 3)Come up with a �natural� explanation which at first was met with a pronounced skepticism but which later would become dogma, i.e.� darwinism, the big bang theory, dark matter, continental drift and Cold Play�! William: 4)Gradually rally around the natural explanation because really, what else have you got. 5)Dogma. 6) Verify that constants are �constant� by using constants to arrive at a date a �natural� reactor was in operation. 7)Turn around and use Oklo with your new assumption generated numbers to prove that constants have always been constant! 8)Try to taunt creationists with your proof�! Christians on the other hand should know consistent with their belief in both the �fall� and the flood have accepted a view that is completely opposed to uniform assumptions. Our view has always been catastrophic. Who knows how submersion in water for up to a year or more is going to impact radiometric dating? Logically, both the fall of man and the flood eliminate uniformism. This last part is to address the idea that there are Christians who�ve been impacted by the Oklo phenomenon in terms of their faith. You said some of them have been cowed by it and I�m just saying that perhaps they haven�t fully thought out what the implications are of their belief in the Biblical teachings on the history of the planet and the creation of the universe�. Robert: "To be honest, I feel like you�re weaseling out of the Oklo implications, here. The one thing you�ve said which I will need to go and research is the idea that to arrive at an Oklo date they assumed constants were constant. That doesn�t seem unreasonable to me because ; what else could they assume�. William: "You do know that there has been research indicating that the speed of light and other constants have or are changing? One of those studies even focused on Oklo, though they didn�t suggest a magnitude change in the constants. Would you also agree that if today the fact that matter and energy are �conserved� indicates that there was a time before the present physical laws in this universe were set that another law, permitting the creation of matter must have been in effect�? William:� The Big bang was invented by someone who believed in the creation theory. I believe he was a minister who thought the big bang evidence supported the idea that God created the universe. However, the big bang couldn�t have created matter, it was how matter was dispersed, wasn�t it�? Robert: "I'll get back to you on that�. William: "Continuing to respond to your Oklo information. You mentioned mutation. The idea that radiation from the nuclear reactor sped up evolution. I suppose I can�t just say �that�s dumb� and go back to frying this turkey? It is you know. Mutation is bad for organisms, not good. Mutation destroys information, it does not add new information. This means that entropy, not only is at work in the universe, it is also at work on the genome. Ironically the very thing that evolutionists believe is responsible for building on the genome and increasing information is doing the exact opposite. In fact, mutation in humans is much more frequent as previously thought. The human genome is gradually being destroyed by mutation. A population geneticist named �Crow� (and he�s on your team) estimates that humans are experiencing an irrevocable net loss of genetic information such that the �fitness� is declining by 1% to 2% per generation. This means that eventually, the human genome will lose too much information for the human race to continue. Read Remine�s book on Haldane�s Dilemma or Sanford�s Genetic Entropy. This of course has implications for the future and the past. In 8 generations, or 200 years human fitness may decline as much as 16% from today. Now if you take these numbers the other way; how old could the human race be? Robert: �I believe I will find your picture in the dictionary under digress�! Let�s eat turkey tonight and finish this discussion by e-mail. I�m going to get some more material and stay focused on Oklo. I think I can make some progress with you on this because it is so conclusive�! William: �At your current rate of �progress�, should it remain constant, you�ll accomplish nothing in 2 billion years�.